When a late-night accident claims the love of her life, Emma secludes herself in memories of James. In his sandy brown hair and clear blue eyes. In their innocent first kiss and declarations of love. In their plans for a life together after college. But happy dreams can’t rid her of the guilt she carries. She can’t erase her actions the night he died. She can’t erase her reaction at his funeral. And she can’t erase the hollow void that fills her chest and consumes her heart. The first time Emma hears James’ voice, she’s astounded. It sounds as if he’s standing right beside her, and she fears her shattered heart is trying to drive her mad. But as she continues to hear the voice, she finds comfort in it. With the help of her best friend, Shel, and handsome newcomer Dane, she tries to move forward and start living again. 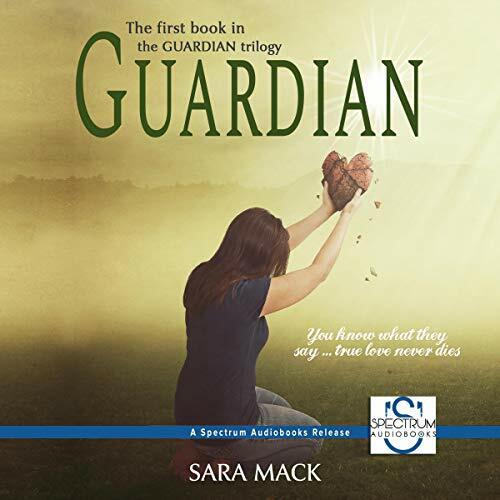 Guardian is the first story in the Guardian Trilogy by Sara Mack. Such a powerful story of love and loss. What at first starts off as a story about a girl (Emma) grieving the loss of her beloved boyfriend (James) quickly turns into a paranormal journey when he returns. At first, she is freaked out until she realizes that she isn’t crazy. James is really there, and he has been assigned as her guardian. There are so many twists and turns throughout this book, the tug of sadness and Emma’s desire to stay true to James throughout the book really tugged at my heartstrings. It seemed as if she really loved him, and the whole decision of James’ at the end of the story left her totally devastated. I don’t’ want to give any spoilers away, but I will say that I am left in awe of the way the book ended. I need to know what happens next! The narration is smooth and easy, flowing well with the overall tone of the story to create an enjoyable listening experience. What an interesting listen this was. There are a lot of emotional ups and downs throughout this book, in general. It seems like it's going to be a second chance at love after loss. Our main character cant seem to make up her mind and it does get a little frustrating towards the end. The entire story is very well written and has excellent descriptions throughout. Unfortunately it does end on a cliffhanger, but I am definitely looking forward to the next book in this trilogy. I've listened to this narrator a few times now and am continually more pleased with her performances. I hope the author keeps Sarah Colton and the narrator because she was a perfect fit for Emma and the trilogy. She definitely made this longer listen fly by like nothing. She was really able to capture all the emotion throughout! Looking forward to more by this author narrator duo and to see where this story goes! Wow, great start to the series. I hope that the next book comes out soon. I'll be thinking about this one while I wait. Great narration. Great intro to several characters. There's friendship, love, heartache, and a building mystery. Looking forward to the next! I was provided a free copy of this book at my request and am leaving a voluntary, unbiased review. I really, really enjoyed this book. It was a different concept from most books. It was very well written and insanely interesting. I wanted to skip to the last chapter so badly just to see how it ends, but I was patient and listened to the whole book in the correct order. I’m not even sure where to start with what I liked about the book. All of the main characters were likable. Even her parents were like able. The story line is unique and kept me interested. The narrator is excellent! I really hope I don’t have to wait an entire year for the next book in the series. This one ended in a way that has you dying to know what happens next. I received this book for free from Audioboom upon my request. The review is 100% my personal opinion. Wonderful story about grief, love, and personal growth. I loved the context of the story and the way the author created this world. I do believe the book ran/lasted a little too long and lots of "fluff" could have been taken out. But overall, great experience listening to Spectrum Audiobook's Guardian. Sara Mack is definitely an author to look out for! Sarah Colton was a great narrator and I'd listen to her again and again. She put a lot of emotion in the characters, which I loved! I absolutely loved it! This book is full of sorrow and joy. The narration is superb and gives the story that extra flair. It will keep you entertained. This author does a great job with the character builds and plot. This was my first book by this author but definitely not my last. I look forward to reading more of her books. I was given this free review copy audiobook at my request and have voluntarily left this review. This is an enjoyable, well written, well told story that grabbed me at the start and captivated my mind to the very end. Sara Mack takes you on a journey and an emotional rollercoaster ride, a heartfelt one. Her characters are complex and well developed. The lead characters, Emma, is left heartbroken after her boyfriend, James, the love of her life, dies in a car crash. They were away at college when this occurred and Emma returned home to grieve and be with family. She was able to finish her classes online. After the funeral Emma started to imagine hearing James’ voice. Little at first then more and more, then he showed himself. At first I thought this was a figure of her imagination. We soon find out what is going on, how James was able to return, what is to become of him. I loved this imaginative and original story Sara Mack created, it is more than a ghost story, more than a romance it is a journey, self discovery, learning to survive again after a loss and most of all she makes you think and wonder. There is a lot of drama in this story, some laughs, some suspense, some brutality and lots of love. I highly recommend it and am hoping the rest of the series comes out on Audible real soon. Thanks for this great story. I listened to the Audible edition, Sarah Colton is a wonderful narrator and voice performer. She performs the voices for all characters gives each their own unique sound and personality. She brings them and their story to life from the pages to your ears. Thanks for this great & entertaining listen🎧.